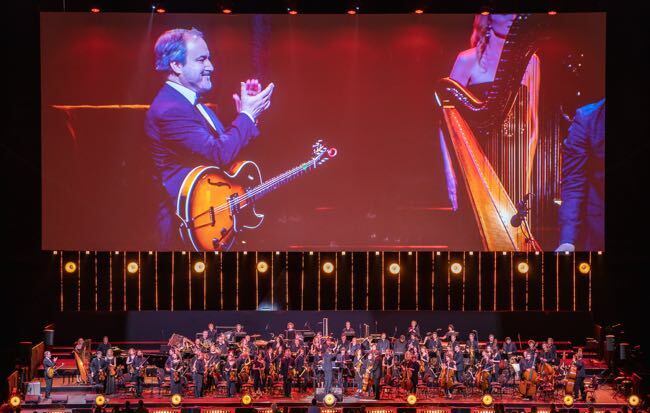 KRAKÓW – David Arnold and his music for the James Bond film “Casino Royale” made sure the 11th Kraków Film Music Festival ended on a high note Sunday night as he played the iconic 007 guitar theme over the end credits at a screening of the film with live orchestra. Arnold had written the scores for “Tomorrow Never Dies” (1997), “The World Is Not Enough” (1999) and “Die Another Day” (2002) with Pierce Brosnan as Bond before the role was reimagined with Craig. He wrote the music for one more Bond film, “Quantum of Solace” and films such as “Made in Dagenham” (2010), “The Chronicles of Narnia: The Voyage of the Dawn Treader” (2010), “Paul” (2011) and TV’s “Sherlock” along with Michael Price, and he will score Stephen Gaghan’s “The Voyage of Doctor Doolitte” starring Robert Downey Jr. due in 2019. Saturday night at the festival had seen the Video Games Music Gala, also at the Tauron Arena, with world premieres of suites from many games by composers who were there including Academy Award-winner Elliot Goldenthal (“Frida”), Christopher Drake, Richard Jacques, Jesper Kyd, Eimear Noone and Austin Wintory. Swiss conductor Ludwig Wiki conducted the Beethoven Academy Orchestra and the Pro Musica Mundi Choir for most of the evening and they went beyond the call of duty to perform the typically bombastic music that video game fans adore. Goldenthal’s “Final Fantasy: The Spirits Within” suite, from the 2001 computer animated sci-fi film inspired by the “Final Fantasy” video games, was the highlight of the evening with its sweeping orchestral techniques. 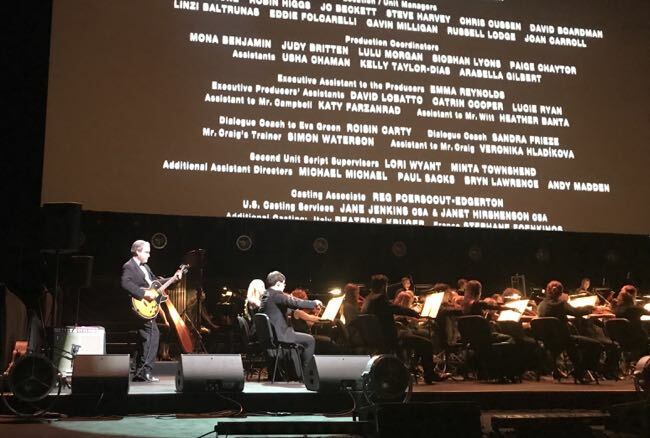 The concert opened with a suite for “Medal of Honor” (1999) that showed the early promise of American composer Michael Giacchino, who went on to score editions of the “Star Trek”, “Planet of the Apes” and “Jurassic World” franchises and won an Oscar for “Up”. A suite from “Silent Hill: Downpour” was performed in remembrance of the late American composer Daniel Licht with his frequent collaborator Norman Kim adding his voice and electric mandolin playing with Tina Guo on the electric cello (below). Other soloists who performed included Sara Andon on flute and Przemysław Sokół on trumpet. Austin Wintory contributed suites from “Journey: Apotheosis”, “ABZÛ: Delphinus delphis” and “Assasin’s Creed Syndicate: Ballet of Blades”. Jesper Kyd was on hand with suites from “Assassin’s Creed” and “Hitman” with Benoit Grey on bass, Eimear Noone conducted her music for “World of Warcraft” and “Lifeline” and Christopher Drake was represented by suites from “Batman: Arkham Villains” and “Batman: Arkham Origins” and Richard Jacques by “Headhunter” and “James Bond 007: Blood Stone: Athens Harbour Chase”. A suite from “Phantom Doctrine” by Marcin Przybyłowicz and Jan Sanejko opened the second half of the show followed by “The Witcher 3 Suite” by Piotr Musiał, Marcin Przybyłowicz and Mikołaj Stroiński with singer Ania Karwan. 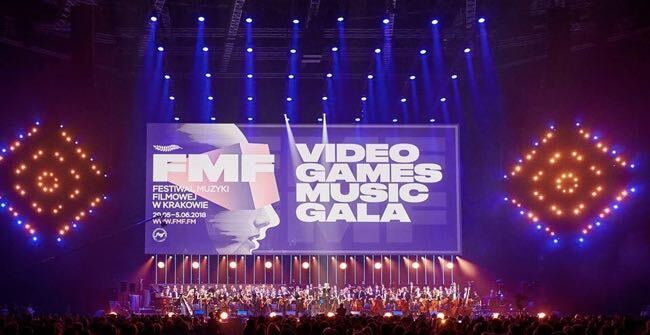 CD PROJEKT RED, producers of the hit “The Witcher” games, were awarded the FMF Ambassador Award during the concert and Marco Valerio Antonini, from Italy, won the sixth FMF Young Talent Award competition. Other recitals at this year’s KFMF included Cinematic Piano at ICE Kraków’s Krzysztof Penderecki Hall on Saturday in which German pianist Hauschka (Volker Bertelmann) and American pianist Dustin O’Halloran (above) performed improvised variations on themes from their score for the 2016 Garth Davis film “Lion”. It included a touching tribute to the late Icelandic composer Jóhann Jóhannsson (“Sicario”, “The Theory of Everything”, “Arrival”) with a performance of one of his concert hall pieces. “The Art of Inspiration” (below) presented by Varèse Sarabande” at ICE Kraków, featured pianist Austin Wintory, cellist Tina Guo, flautist Sara Andon and conductor Eimear Noone perform while artist Angela Bermudez painted an art work. This entry was posted in Film, Krakow Film Music Festival, Music, News and tagged 'Casino Royale', 'Lion', 'The Witcher', Angela Bermudez, Austin Wintory, Beethoven Academy Orchestra, CD PROJEKT RED, Christopher Drake, Cinematic Piano, Daniel Licht, David Arnold, Dustin O’Halloran, Eímear Noone, Elliot Goldenthal, FMF Ambassador Award, FMF Young Talent Award, Gavin Greenaway, Hauschka (Volker Bertelmann), ICE Krakow, Jesper Kyd, Jóhann Jóhannsson, KFMF18, Krakow Film Music Festival, Krzysztof Penderecki Hall, Ludwig Wiki, Marco Valerio Antonini, Michael Giacchino, Norman Kim, Pro Musica Mundi Choir, Przemysław Sokół, Richard Jacques, Sara Andon, Sinfonietta Cracovia, Tauron Arena, Tina Guo, Varese Sarabande, Video Games Music Gala. Bookmark the permalink.